Slowly I am starting to add some fall to the house. It is hard to think of fall when it is in the 90's again this week. Last week it was beautiful in the low 70's and 55 to 60 at night. The perfect sleeping weather. Now we are humid, hot and crabby!!!! I tried to feel some coolness by starting on my fall decor inside. Outside will have to wait with the summer flowers still going strong. 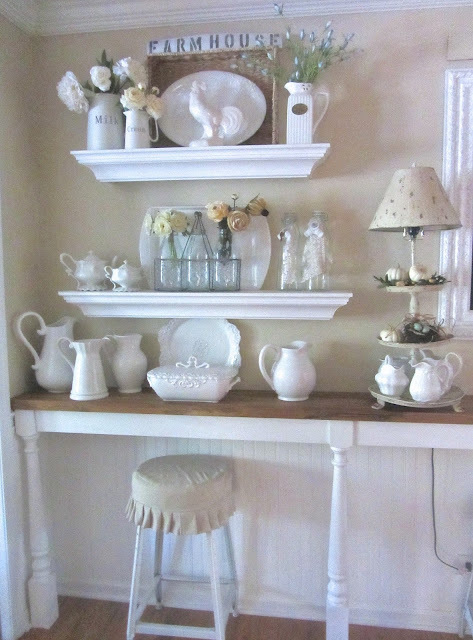 This is the table scape I made in whites and creams for the center of my dining room table. Remember my little chippy chair transformation. It needed a little Fall decor. Do you see where I got bold and added the bright yellow fall leaves!!!! Ha Ha I am rebel with adding some color to the white neutral fall decor!!! I added some small white boo pumpkins to my sideboard light. Added some cream dried hydrangeas to the our nest sign in the entry way. Added some cream and white mums to the old flower gathering basket hanging on the hall tree. 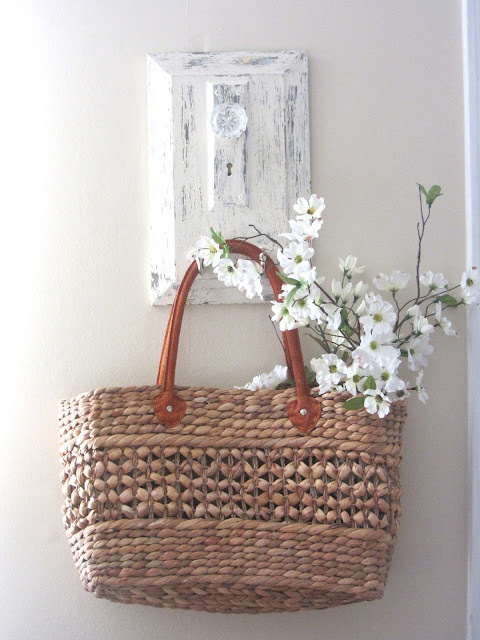 Added some flowering crab apple stems to another gathering basket at the front door. Have to give a big shout out to Becky at Time Washed for this cute pumpkin she made and I bought. I loved the colors she used in this one and how it really matched in the living room. 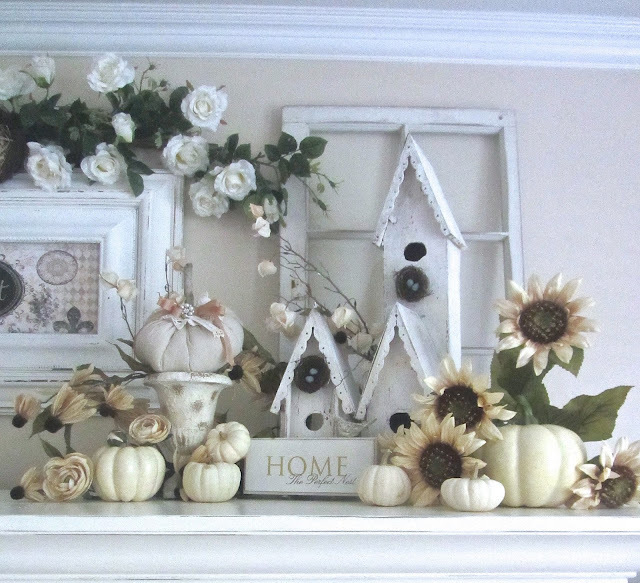 If you have not been to Becky's beautiful blog or her Etsy shop you must jump over there and check out all her cute fall decor. Stuck that beautiful pumpkin in an old chippy urn. Added some baby boos and fall flowers to the top of the TV cabinet for some fall color. Then I tried to do up the arrangement on top of my coffee table. Still was feeling too fussy and too much. So I tried it up on the TV cabinet again. This time I put the fall flowers and decor over to the side more. I tired to give you an up close shot so it looks a little crowded but when you stand back and look at the whole cabinet it does not look so crowded. Even though they are saying 95 today I tried to get some fall up inside. There is a saying here in Chicago that goes like this, "If you do not like our weather here just wait 5 minutes and it will change"!!! They are now saying by Friday the high will only be 60!!!! So we will melt today going out the door today but by Friday we will need a sweater!!!! Hope your weather is nice where you are. It all looks so fallish and charming at the same time. I see that you have some cream color sunflowers...I got some at Joann's last week for a fall wreath (just gotta find some time to make it). Enjoy the cooler temps this weekend...we will be in the low 80's. Luv all your Fall decor Kris. All the little pumpkins and florals. Beautiful!!! Everything, and I mean everything, looks wonderful. I just learned the name, boo pumpkins. They have some in the stores this week. 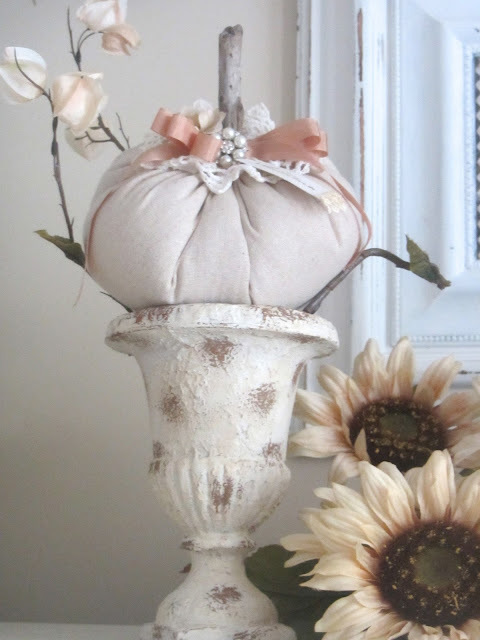 But, I am going to make one of the cloth pumpkins today. I found a tutorial on another blog today and that will be my project. I figure if I make varying sizes, they will carry me through Thanksgiving. I am also going to copy your idea of the hanging baskets. I think I can hang one on the fireplace screen for now. We won't have a fire until mid October. you made some very pretty flower arrangments and centerpieces. Our weather will be the same here in Ohio, Kris! It's funny, they have that same saying here! 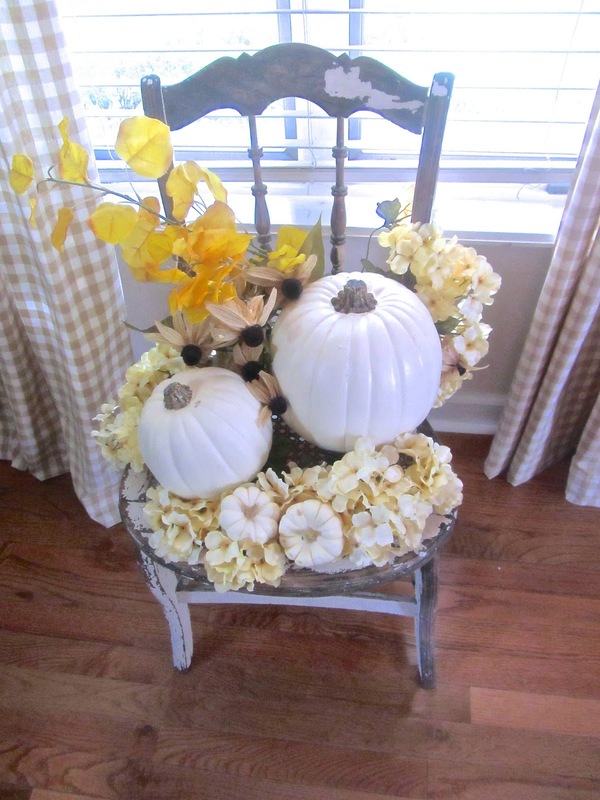 : ) Your Fall décor looks great. I love the white pumpkins. I love Becky's pumpkins! I have a few of those myself. I'm looking forward to decorating for Fall, but I'm figuring at least another week or two before I get myself up to the attic to get my bins. Love all your changes....we are also getting in the 90's today and tomorrow and then a cool down.........its just crazy!!! Oh I love all your little fall embellishments. I love your space with the stool and little bar area.. Cute Cute Cute. We're having the same weather here in Ontario and talk about a yoyo! I think your fall decor is just lovely, and I'm crazy about your birdhouses. Every time I visit your blogg I absolutely LOVE what I see. I´m speechless. So beautiful. If only I could make such lovely decorations. I bought a cloth pumpkin at a vintage shop. And now, I'm seeing them all over the place. Thank you, for your sweet comment. 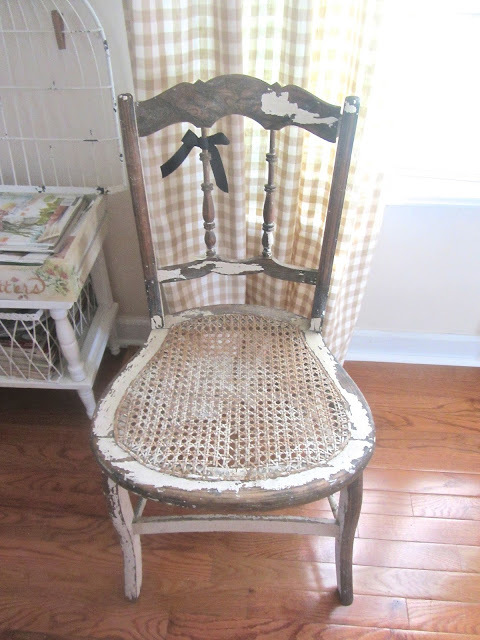 Kris I love what you did with the old chair it is just charming now. You're so lucky you got that weather break, no such luck here in the South. 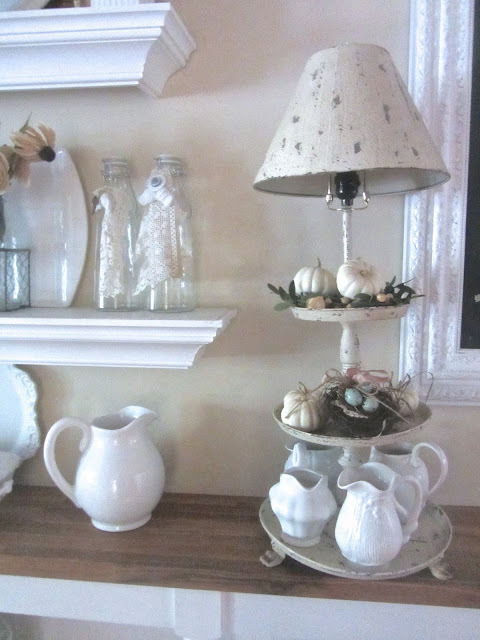 I love all the Fall touches scattered about your home, I love the cream and white pumpkins, right up my ally. Not a fan of typical orange pumpkins although I do decorate with them sometime. The touches of color you have added really enhance the creams and whites and don't take away from them at all. Once again you have created so much loveliness in your home Kris. Love all your pretty Fall touches! it all looks lovely, kris! love becky's pumpkin, too! i'm trying to find some blue pumpkins, but, so far-nothing. the weather is crazy, huh? You see - you CAN have a white fall - I knew it!!!!!!!!!!!! Need to paint a few of them myself this year! I like your neutral fall decor, Kris! It's very soothing and pretty. Every thing is just so...adorable! Kris...I love how you've decorated for fall without all the screaming orange. I can't have that with my pastels either. 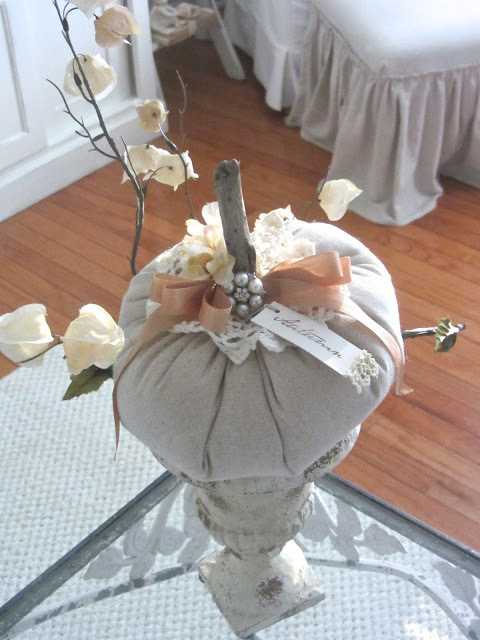 Thank goodness for white and gray pumpkins! I just love everything, the little chair you decorated is just too cute. 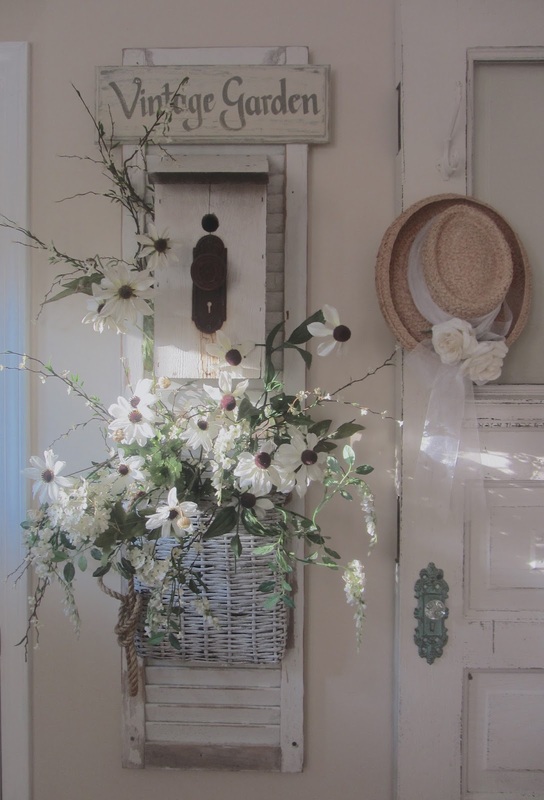 I am really coveting those white sunflowers, please tell me where I can get my little hands on some!! Gorgeous! Love the whites, and the pumpkin from Timewashed is so pretty! Your Fall touches are just beautiful!! I need you to come help me decorate for Fall. It was in the low 90's here today and it is going to 90 again tomorrow...but 67 by Friday. I'm so ready for the cooler days of Fall. Ha! you're way ahead of me! And it looks wonderful Kris. I haven't found any baby boos yet. Love them. As usual you've absolutely taken my breath away with your GORGEOUS displays! I Love, love, love the way that you guys in America go to so much trouble to celebrate what you call 'Fall', here in the UK no one really makes a thing of it, such a shame! Love all your displays....and that pumpkin....seriously! OMG Kris, I am loving what you have done with your fall touches. They are all gorgeous but what you did with the chair and that shutter just grabbed me. You are my superstar!!!! I came back to show that I really love your style. How I wish I could come and grab some your blings *LoL (joke). I am your new follower too and I will link you blog, so I won't miss a post (ever) again. Thank you for all the inspiration . . . love Becky's pumpkin, too. Everything looks so wonderful. My favorite is the chippy chair. I can't believe I passed one up last week because it was $15.00. Now I think that was actually a pretty good price. I doubt very much it will still be there. We are hitting high temps this week, too. First frost is due this Sunday. Crazy weather. Kris, Thanks for your inspirational touches of Fall. In San Diego the weather has been very hot for the last month. I've been outside trying to keep all the plants happy. But, looking at your beautiful house has motivated me to start thinking of Fall. I love your boo pumpkins, so cute! Wow, I'm blown away by your beautiful home! 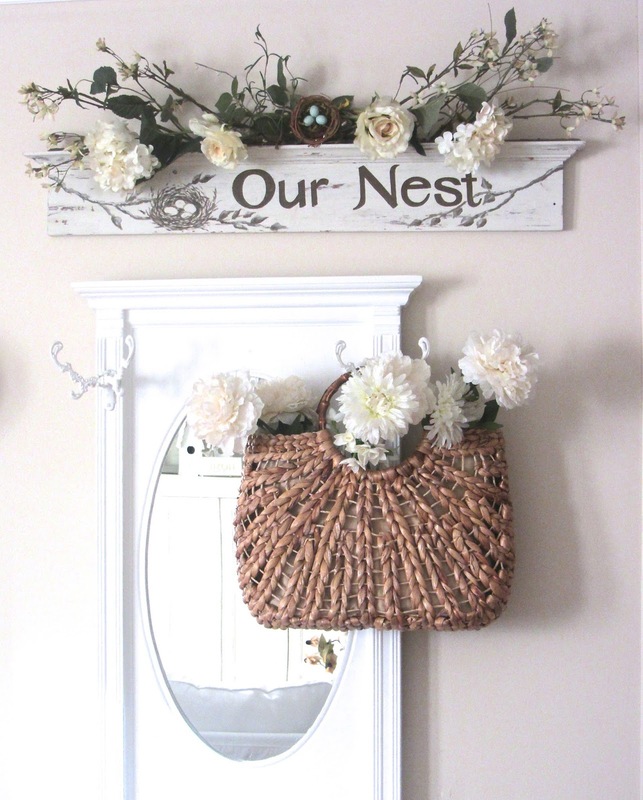 So pretty and you definitely have a knack for creating beautiful vignettes. I especially love the bird houses. I like the word prettily. If is not a word maybe you just invented one. I like it. Thanks for your sweet comments. lovely Fall decor Kris. I always love my visits to your warm and cozy home! it's all so beautiful, Kris. love that basket full of "susans", and your wonderful table centerpiece! Kris, I am so excited to tell you. That chippy white chair I mentioned in the earlier comments was still at the thrift shop! My sister drove me back to the shop and it was still there a week later. It was just meant to be. Now I am going to decorate it somewhat like the one you did. I just had to tell you. I am so excited. Wonderful! I'm going to try these colors this year instead of the traditional colors. Found you through Share your Cup Thursday party. Gorgeous splashes of Fall! I love your shelves and the way you've styled them ... and, the pop of yellow looks wonderful! your vignette made me feel inspired. Had to laugh at your weather as we were happy to read our LOW will be 60 by Friday here in Texas. The low all week has been in the high 70's! I sure enjoy looking over your sweet vignettes! I add a few ambers and rust to my white in fall. I prefer the quieter tones for the most part too. Love Becky's pumpkin! As usual, your home and decor are just delightful! Thanks so much, Kris, for giving my blog and shop a shout out! So glad you are enjoying your pumpkin!! It looks wonderful amongst your other pretties! It was a joy to create! Truly aaaaaaahhhh-worthy! I adore it all! Love all your cream and white pumpkins!! Everything looks beautiful!! Love all of your touches of fall Kris! Your vignettes are perfection! Oh Kris, your home is looking as amazing as ever! In Oz we are going into Spring, but we still get really cold days, and then Summer heat the next. I love Autumn though, all the pretty leaves! Kris I love all of your fall touches! Thanx so much for joining THT. Kris, It all looks fabulous! I really love that sweet pumpkin in your urn. You have such a knack for putting things together! Thanks for sharing with SYC.